We were supposed to head to Philadelphia, to meet with our friends Caroline and Bob, in September but Hurricane Florence had other plans for us. We were safe and sustained no damage from the hurricane but our flights were cancelled. We rescheduled, which meant we ended up with a shorter trip, two nights instead of three. It is amazing what you can cram into a short amount of time when you are on a mission. With laptops open and a calendar in place, we figured out the remaining stop on our January journey to the Yucatan. 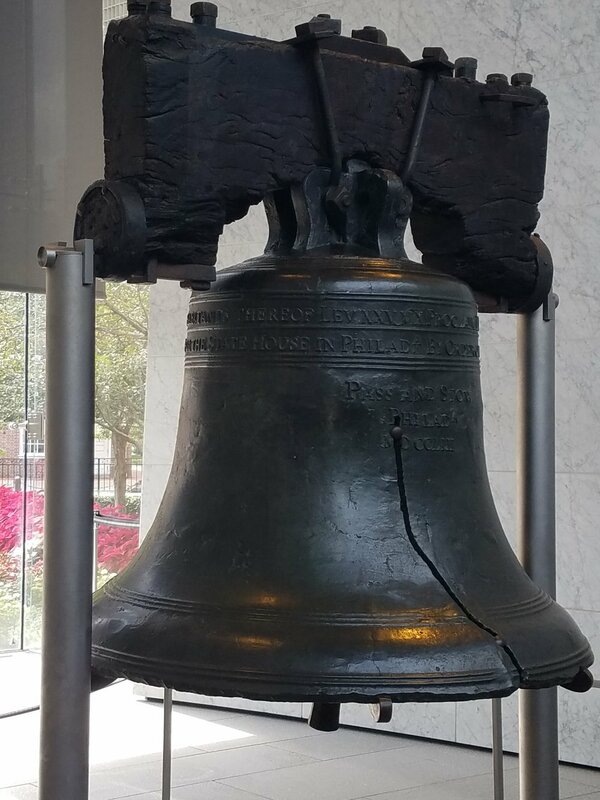 More about that later but first the highlights of Philly. We put a good 4 or 5 miles on our fit bits walking all over the historic district. Bob grew up in South Philly so we had the perfect tour guide. 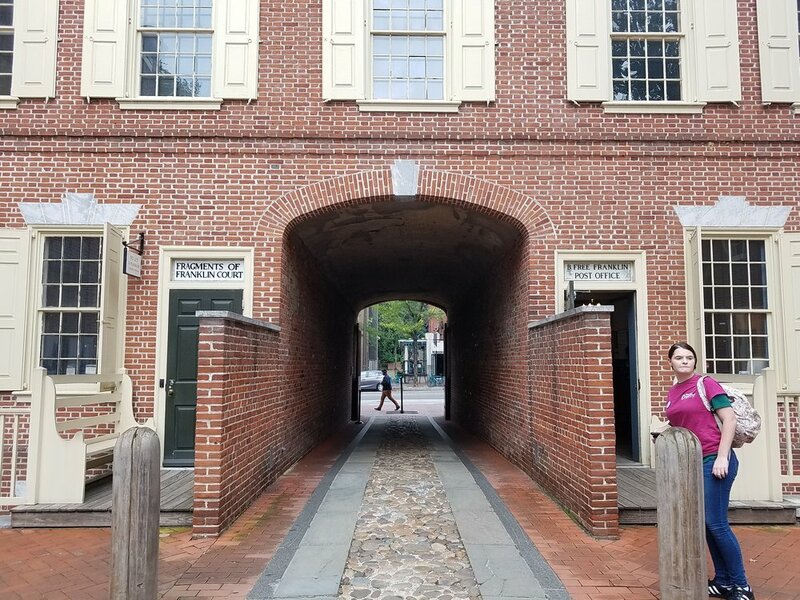 Saw the Liberty Bell, Washington’s temporary home, Ben Franklin’s home and printing press, one of the oldest continuously occupied residential alleys and, of course, Independence Hall. 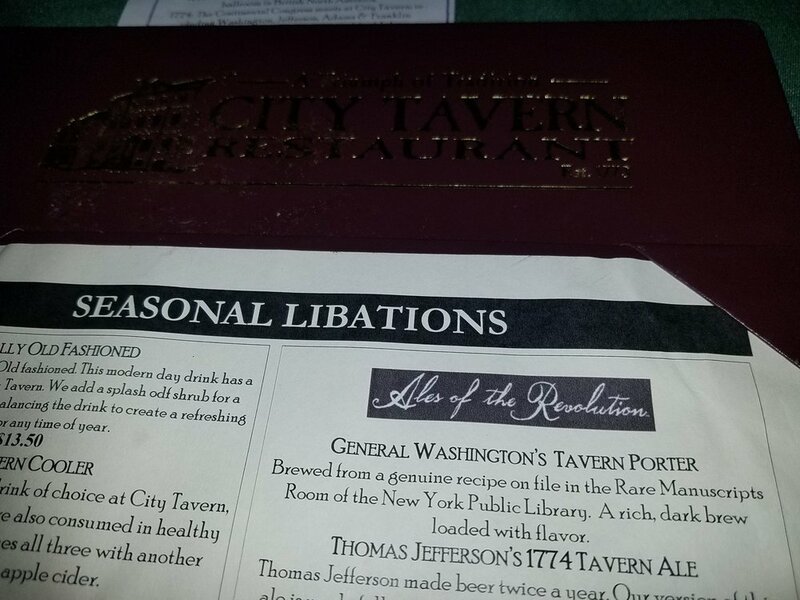 We ended our tour at one of the oldest taverns, City Tavern, which was not the original but still a lovely spot. Not being one who likes a lot of different beers, I decided to try the spiced rum with apple cider and now have a new fall drink! After a fun day of walking all over Philadelphia we headed to The Victor Café. This place is so full of history. You just feel like you are in a gangster movie like Godfather or Good Fellows when you walk in. Or, if you’re a “Rocky” fan, you’ll remember this as Adrian’s restaurant in two of those movies. Upstairs is the bathroom and a bar that looks like a bordello. It wasn’t open the night we were there but it was impressive. The walls are full of old photos of family and famous Opera singers. This restaurant has been open over 100 years and the same family has owned and run it for generations. It has always been well known for its Opera and all of the waiters are singers, and each stopped and take turn singing every 20 minutes. Even if you are not a fan of Opera you will be so wrapped up in the moment that you will love it. The food was amazing. But what would you expect from the oldest Italian restaurant in South Philadelphia? We ate so much I am not even sure I can remember everything we had. I know I tried fried smelts, called Burrara, for my first time, fishy but interesting. We also had a lovely beet salad appetizer. For dinner Caroline and Mike hit the spaghetti in red sauce with sausage, meatball, and bragiole (a rolled, stuffed flank steak}. OMG. I had the chicken in a light lemon, butter and garlic over angel hair. It was a wonderful dish but the portions were huge. Bob had a pasta and fish dish that he said was incredible. We called the night off with Caroline’s chocolate truffle loaf, berry sauce and whipped cream. We had an early flight out the next morning, but I refused to leave Philly without a cheese steak, so we grabbed a Philly Cheese breakfast sandwich at the airport to split. Our short trip was cut shorter because our Frontier flight to Philadelphia ended up being 6 hours delayed - 4 in Philadelphia coming to Charleston and another 2 in Charleston. That said, we got a feel and taste of this great city and will be back.